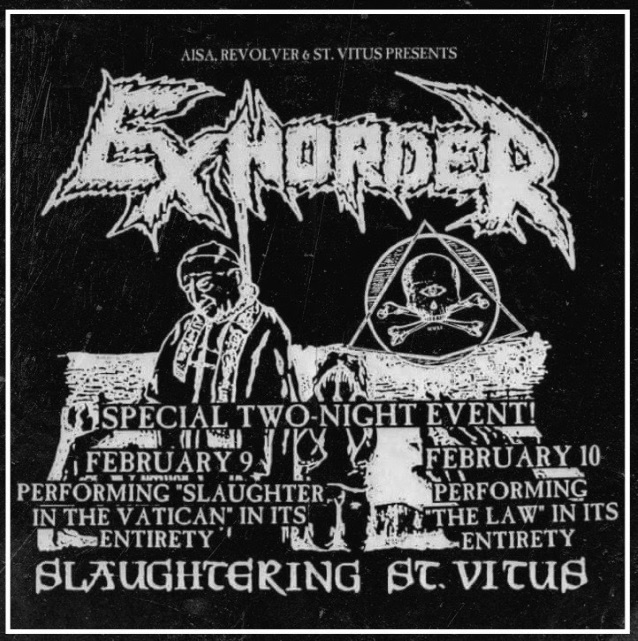 The new lineup of the legendary American thrash metal band EXHORDER made its official live debut last night (Friday, February 9) at the St. Vitus Bar in Brooklyn, New York. Fan-filmed video footage can be seen below (courtesy of Chucky Browns Hood TV). Thomas told The Metal Crypt that "it's really kind of odd" how the EXHORDER reformation happened. "We had been gradually talking again after many years of not seeing each other too much, and one night we were at a Corey Feldman concert, of all places," he said. "It just kind of popped up where we were like, 'Do you want to?' and the other guy said, 'Yeah, sure.' It was just about that boring." Thomas also talked about EXHORDER's latest additions, explaining: "Jason has been a friend of ours since the '90s, and he has a long history of being involved with EXHORDER. It always seemed like he was around right before we broke up, so maybe he is the problem. [Laughs] Seriously though, Jason and Vinnie started YEAR OF THE TYRANT with Sasha Horn, which Dan Nelson [formerly of ANTHRAX] has now joined. Marzi invited me to collaborate with him in HEAVY AS TEXAS and we played one show last year. We are currently recording an album together. 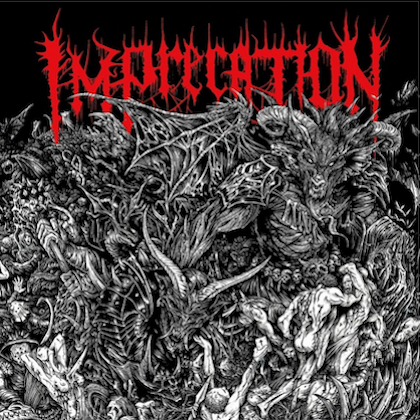 Marzi jumped on board recently, and the two bands kind of merged into an EXHORDER reformation. Weird, but it will be amazing." EXHORDER is planning on making several festival appearances during the summer. The band will also play a homecoming show in New Orleans at Southport Hall on February 12. Kyle confirmed that if the upcoming shows go well, there are plans for EXHORDER to play more concerts and possibly even work on new music. "We are going to gauge the interest level before we go crazy booking a lot of shows, but the more we get into this, the more it seems likely that a lot will happen with new material eventually surfacing," he said. "It's pretty exciting having it unfold before our eyes." 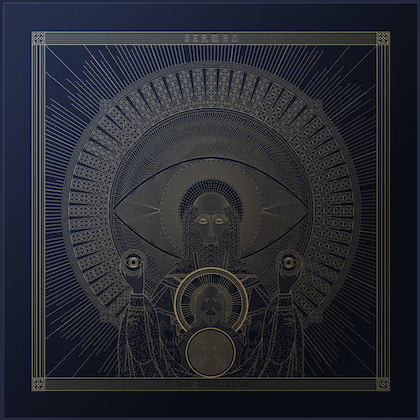 As for what a new EXHORDER album may sound like, Kyle said: "We would want it to be deserving of the EXHORDER logo on the front of anything we release. We owe that to the EXHORDER fanbase. We owe that to ourselves also. I have a pretty good feeling it will not disappoint." 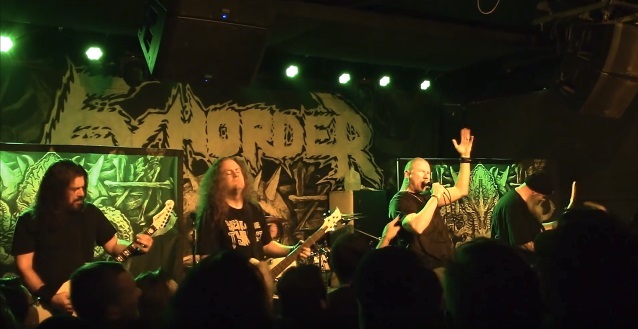 EXHORDER is cited by many as the originators of the riff-heavy power-groove approach popularized by PANTERA.